Richard Paige — Nearly lost in the shuffle of Senior Week and Commencement was a noteworthy announcement out of Goodrich Hall. Yang Yang ’17 was named the FortKnight of the Year. Again. Four-time FortKnight of the Year Yang Yang ’17. Every other week, the mathematics department issues a Problem of the Fortnight that is open to any member of the Wabash community. Submissions are judged both on correctness and elegance. Nods are given for solutions, while the best ones are posted. The person with the most solutions over the course of a year is named the FortKnight of the Year. To say he’s the best problem solver on campus might be an understatement. Yang has earned the FortKnight distinction four years in a row. 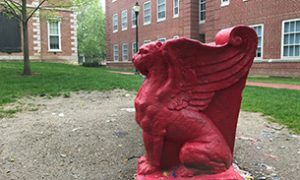 “We don’t keep good records, but I’m guessing no one has done it before,” said Mathematics and Computer Science Professor Robert Foote. 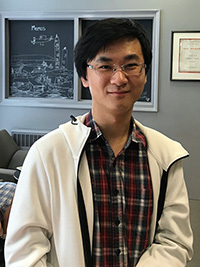 For the physics and mathematics major who earned distinction on comps, the uniqueness of this accomplishment is as appreciated as an elegant solution. To hear him describe it, each problem was 20 minutes of fun. Now that he’s moving on to study physics in graduate school at the University of Minnesota, Yang has another problem left to solve – the weather. Richard Paige — The pause lasted 12 seconds, so I knew the answer was meaningful. During a recent visit to Phoenix, where Stephen Batchelder ’15 teaches eighth-grade science, I asked him about his favorite Wabash memory, and he took that long pause before responding. He went on to describe “Poetry Hour,” a time during the spring semester his senior year that he and classmate Ryan Horner would carve a free hour out of a week and meet at the Senior Bench to share things of interest, whether it was a piece they had discovered or something one of them had created. “We would kind of sit there and be quiet with each other and do some writing of our own,” Stephen remembers. Ryan fondly remembers that shared time well, including the text message that started it all. “Stephen sent me a text completely out of the blue, saying that he would be at the bench at so and so time, probably reading or writing a little bit of poetry, and that I’d be welcome to join him,” he says via e-mail from UC Davis, where he is finishing a master’s in creative writing. It didn’t take long for these Poetry Hours to become a regularity, even a necessity. Nearly everything about the get-togethers were malleable. Sometimes they read (Horner started reading David Foster Wallace’s “Infinite Jest” during one of these sessions), other times, they wrote. They even took it on the road to places like Sugar Creek or Shades State Park. The only constant was friendship. Anyone’s senior year can rush by, and for Stephen and Ryan, those moments on the Senior Bench were much-needed respites of calm as a new chapter of life was dawning. Not everything in college goes according to plan, not even for those focused and driven like Riley Lefever ’17. One doesn’t collect 158 career victories on the wrestling mat, four national championships, including a spotless 129-0 mark against Division III opponents, and lead his teammates to three consecutive top-five national team finishes without those two adjectives linked closely to his being. He came to Wabash thinking he would be a math major until his confidence was shaken by his first calculus class. “I didn’t do so hot,” Lefever explains. That same semester, he also took an introductory English class with Professor Warren Rosenberg, which Lefever says sparked an interest in creative writing and literary theory that continues today. 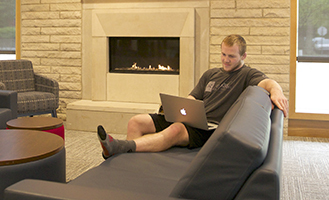 Riley Lefever relaxes in Rogge Hall. The professor quickly returned the compliment. “Riley showed me that not only did he have the skill, courage, and fortitude to win all of those wrestling national titles, but he had the requisite skill, courage, and fortitude to read, truly understand, and gain pleasure from studying such challenging literature.